Certain things irritate everyone. One of my pet hates is busy restaurants because it usually means they’re really good and I can’t get a table. This was very much the case with Dishoom during the Edinburgh Festival this year, which led to a slightly unfortunate altercation with the (otherwise enormously helpful) staff. I had heard wonderful things from Marcus Brigstocke, who had apparently received a round of applause from his fellow diners on finishing his food (he is a man of prodigious appetites, is Mr B.) I had also heard tales of wonder concerning the breakfast naan from Paul Sinha, who is certainly a man who knows his way around an Indian flatbread. So, my wife and I tootled along early one evening, only to be told there was an hour plus wait for tables, and were given a pager which would apparently buzz when one became available. It was not a particularly warm August evening, but after a bit of discussion, we decided we could sit outside as there were a couple of tables free, and maybe move inside later, which is when the staff explained this would mean they had to take our pager off us and remove us from the waiting list. This struck us both as officious and unnecessary, but we were hungry, so we grumbled over a couple of menus, which is never the ideal start to a meal. As we ordered, spots of rain appeared, and I explained to the waiter that if it started raining in a properly Scottish fashion, I would be leaving without paying for my food. The waiter then explained they didn’t have an awning, which is when I explained this was the exact reason I wouldn’t be paying for our food should it become damp. I also think I might have pointed out that if you are a large restaurant which is open all day and has a waiting time of over an hour at 6pm, you could probably afford a f**king awning, so mightn’t it be an idea to get one? Luckily the rain held off, and I seem to remember we had some nice okra and a very tasty black daal amongst other things, but to be honest, the whole experience had left a bit of a bad taste in the mouth, which had nothing to do with the food, and we paid quickly and walked down to Brasserie Prince on Princes Street for a decent dessert to cheer ourselves up. This weekend I found myself in Edinburgh again – with no sign of a festival going on whatsoever, thankfully. I was playing the quite marvellous Stand Comedy Club, and the lovely flat they house comedians in is a mere two minute walk away from Dishoom, so I thought we should give each other a second chance. And I wanted to try that breakfast naan, dammit. Imagine my irritation when I arrived fourteen minutes after they’d stopped serving it. On the plus side, a table had been found immediately and my bright and breezy waiter explained enthusiastically/apologetically that they were very strict on timings as it’s a halal kitchen, and everything needs to be cleaned down to start the rest of the day’s service. To be fair to Dishoom, it’s hardly their fault if I turn up for breakfast at midday. I considered going somewhere else for what was clearly, by this point, lunch, but decided against it and was rewarded for my indolence. I ordered three small plates – a delightfully sticky chilli chicken which I motored through like popcorn at the movies. Also, a pau bhaji – a smooth vegetable curry with hot buttered buns (fnaar,) freshened up with a little lime and chopped red onion. In a nod to my naanlessness, the waiter threw in a couple of extra buns which, as I’d also ordered a vada pau – a thoroughly pokey little potato butty with an exquisite green chilli paste – I didn’t think I needed. I really wasn’t going to eat them until I did. I don’t normally blow my head off this early in the day, but it’s safe to say this was not food for the faint-hearted. Real heat, but married with proper flavours, and washed down with a delicious lime soda made from, er, lemon. All this for around twenty quid with superb service and my entire opinion of Dishoom had been magically transformed. It is easy to see what the fuss is all about with food this tasty, and fun. Still, no breakfast naan – #sadfaceemoji etc. It was only Friday, though and a quick conference with the front desk, whom I now felt so much better disposed to than I had in August, meant I presented myself back in front of them at ten o’clock the next morning. I am happy to report there is no finer way to start your Saturday in one of the world’s great cities than with one of the world’s great breakfasts. 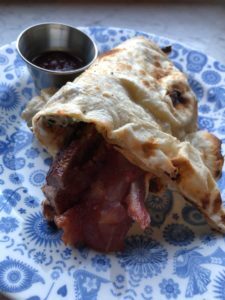 I opted for a bacon, egg and bacon naan and it was a thing of deep, deep beauty. Why on earth have I never had a bacon sarnie with a naan before? Why haven’t you? Excellent ingredients wodged together with a little fresh coriander that just threw in an occasionally welcome herbal note, and a homemade brown sauce that is how I imagine HP tastes in heaven. My only criticism is I wanted another, but my wife gets irritated enough with my Instagram feed while I’m away as it is, and I really wanted to get up Arthur’s Seat, so further carbs and fats and proteins would have been somewhat counter productive. I’m ashamed to say that in over quarter of a century of visiting Edinburgh, I had never made it to the summit, and I’m very glad I took the opportunity to do so today – the view down is every bit as magnificent as the view up has always been. I’m equally pleased I decided to give Dishoom another go. Twice. I’m sure it won’t be another twenty-five years until I make it back up Arthur’s Seat. If only Dishoom opened before I had to get to the airport on Sunday morning, it wouldn’t even have been twenty-four hours before I’d be visiting them for another naan. I hope we’d both be pleased to see each other.